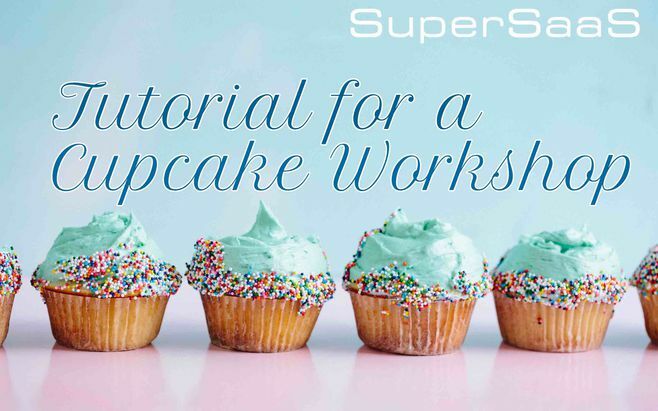 This tutorial uses a cupcake workshop with a waiting list function as an example of how to set up an online event schedule. This type of schedule is known as a Capacity schedule and you can adapt these instructions to suit your particular needs. If, for instance, you intend to have people sign up for a sporting event or you want to organize a party, these guidelines apply as well. If you have several events, need people to select an event date from a calendar, or if your event has several components that can be selected separately, the capacity schedule tutorial would probably suit your requirements better. If you are planning to split the event into time slots where each slot can be booked by one person, like you would for the sign up for a parent/teacher evening, the resource schedule tutorial would be more helpful. In this example, you can create an online event schedule for a single event aimed at a group of people. You can view the end result on the cupcake workshop demo page. In order to follow the steps in this tutorial, you need to have an account. It’s free and all you need is a valid email address. Log in to your account to reach the Dashboard. Click New Schedule in the menu on the right side of your Dashboard. You will be directed to the New Schedule Wizard where you can select the correct default settings for your online event schedule. You will first need to choose whether you want to create a Resource, Capacity or Service schedule. This is an important choice to make at the outset, because the only way to change it is to start again with a new schedule type. For this tutorial, since more than one person can attend the workshop, you need a Capacity type schedule. The title you give to your online event schedule in combination with your account name forms the URL that your clients will see in their browser when they use your schedule. 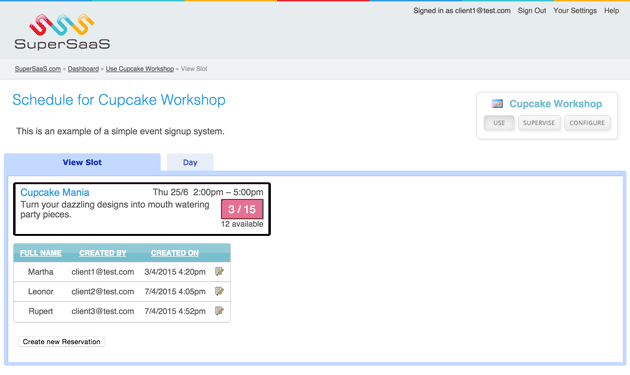 Provide a short but descriptive name for the schedule, for example “Cupcake Workshop” and click Next. You can always change it (as well as your account name) later but note that if you do so, the schedule’s URL will change accordingly. In the next step, you can set how many people can attend your event. For this tutorial, pick a low number so you can easily fill it up with participants in order to test the waiting list facility. You can always modify this later. Select the option to have a waiting list. You can also check Unlimited if you don’t want to put a cap on the number of people allowed to join your event. Set the default length to 4 hours for the workshop. Since there is only one event, under Calendar, select This is only for a single event; simply present a signup sheet. Clicking Finish creates an empty schedule and puts it online right away. You now have a functional online event schedule. Move on to Step 2 to try it out to check that it works as expected. To use your online event schedule as an administrator, click Use in the schedule menu. It is only visible when you are logged in as administrator. Regular users will see the same schedule but with fewer options. You can also find Use by going to your Dashboard. You can access your Dashboard via the link in the top right corner of your screen. You can also bookmark the page in your browser for daily use. 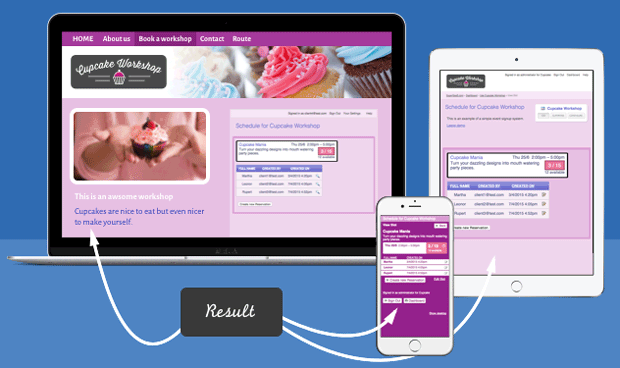 Create a slot that will contain the information participants need to know about the cupcake workshop. When you click Create new Slot, a popup window appears. If this window is in an inconvenient place, you can simply drag it to a more suitable place on your screen. Fill out the date and a descriptive event name, such as “Cupcake Mania”. You can add an image to the Description field by entering a link to an image that is available online (i.e. starting with “http:”). You can also use this field to give a more elaborate description to your online event schedule, such as: “Improve your baking skills and join our workshop! Anyone who loves sprinkles and fondant can sign up”. You can adjust further settings to suit your requirements by clicking Configure. The Overview contains a summary of the options you can change. Here you can temporarily block the schedule or delete it entirely. The New Schedule Wizard made a number of assumptions when you set up your online event schedule. One of those assumptions is that you don’t want to show a calendar screen. You may want to switch this back on if you have multiple events on offer. 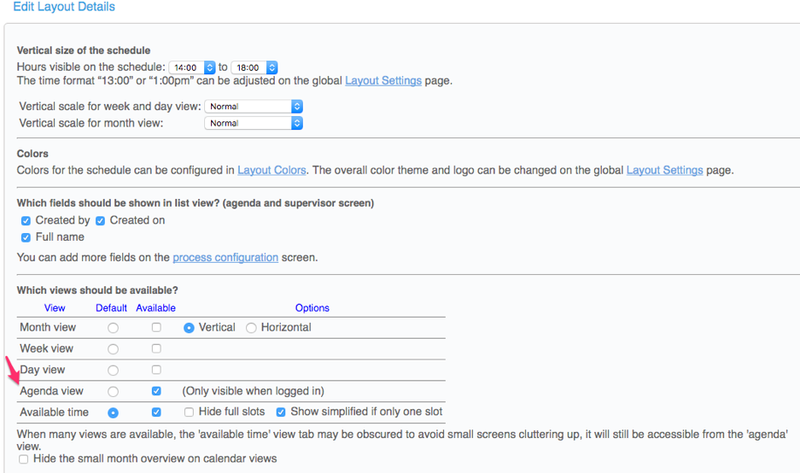 Under Layout, you can configure which views should be available to your participants. Select the option Show simplified if just one event, which optimizes the layout for a single event. If you uncheck it, the layout of the Available tab and the event slot will change to accommodate multiple events. In the standard view, you would be able to edit the slot by first clicking it and then clicking on Edit slot. You can edit the slot in the simplified mode under Overview, which you can access via Supervise. 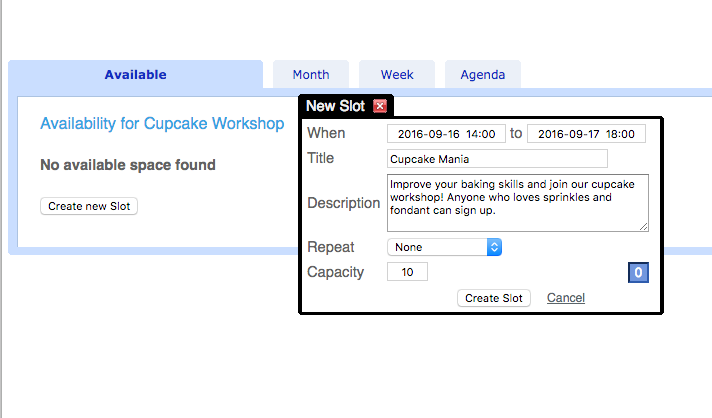 For a single event like a cupcake workshop, you may want to further simplify the schedule by limiting the overview tabs to the Available and Agenda views. On this page, under Message to show at the top of the schedule, you can create custom messages and include HTML text, image(s) or links to give participants more information about the workshop. Save changes at the bottom of the page before moving on to the Access tab. Resources contains the settings that define the general parameters of your online event schedule. The first option deals with naming the resource appropriately. If you decide to give your event a new name, you can change it here. The terms you select to be used instead of the default “slot” and “booking” will be used throughout the online event schedule – including in error messages, email confirmations and help pages. In this case, you can enter the custom term “workshop”. Enter the singular form and the system will convert it to the plural form where appropriate. You can also change the term used for “user” to “participant” for example, but this setting can be found via Layout Settings (keep in mind the terms you set here will apply to your entire account). You can then determine the workshop’s capacity (i.e. how many people can attend the event). If you want to create several online event schedules with different capacities, you can enter the appropriate number for individual events when you create them. Entering zero will switch off limit checking entirely. The second field determines how many places a person can book with one reservation. Setting this value to anything other than 1 will change the user interface to include a quantity field when making a reservation. For this event, you can leave this at 1, but if you are using an online event schedule to sell tickets to a play, for instance, it would make sense to allow people to buy multiple tickets at once. Decide whether you want participants to be able to make a second reservation for the same event. Note that the system can only identify a user by their login name. So if you allow people to create their own login name (or allow anonymous bookings) the system cannot prevent people from making a second reservation by creating a second login name. Determine whether you would like to offer participants the option of putting their name on a waiting list if your online event schedule is fully booked. The choices are simply to deny booking, to allow only those with administrative or superuser access to override the limit, to ignore the limit altogether, or to create an entry on a waiting list. The waiting list creates a separate list for each event and remembers the order in which people entered their names. If the box for automatic placement is checked it will automatically schedule the first person on the waiting list if someone cancels. If you allow multiple bookings per person and someone requests more spots than are available, they will be moved to the waiting list. Upon booking, a quantity field will appear that allows participants to enter the number of places they want to book. You can change the field name “quantity” to a more appropriate term such “number of seats”, via Process, where you will find the section What information should the client enter with each reservation. Here, you can select the second Customize link and enter the appropriate field name. If someone requests more spots than are available they will be moved to the waiting list until enough room is available. Should a participant cancel their booking, automatic placement will only take place if there is enough room to satisfy the quantity requested by the first person on the waiting list. As administrator, you can move people from the waiting list, at any time, even if that means group totals would go over the set limit. Keep in mind that automatic placement will obey the time limits that you can set via Process. If you set a limit to only allow sign up until one day in advance of the event, then the automatic placement will stop there too. Specify where the event takes place by adding the address to the location field. If you have multiple classes, the interface will make room for the additional information. This can be used to specify where the event takes place if you have multiple classes. If you publish your calendar this information is also transferred to the appropriate location field in Outlook, iCal or Google Calendars. You can set the price of your event or capture credit card details (but not the 3 digit credit verification value codes). By clicking Setup pricing you can create advanced pricing rules, such as an extra charge for lunch before the event. This is discussed in detail under Adding payment to your schedule. Under Time, you can set a default length for slots and modify the user interface for time display. Rounding all times to whole days can be a good idea if you are using SuperSaaS for events that take multiple days. Test the event schedule from a participant’s perspective to ensure it behaves as expected. You will need to switch between administrator and user access, which is discussed in more detail under Testing the schedule you created. You can create a booking as a user and delete it once you have checked that your online event schedule works. Every schedule has its own URL, which can be viewed under Overview. If you want to direct a client straight to a specific schedule, then you can copy/paste this link to an email or SMS. When a participant opens the online event schedule, they will be able to log in at the top right corner. Once you have configured your online event schedule and have tested it to ensure that it behaves as expected, you are ready to direct your clients to it. Find out more about this in the documentation outlining how to integrate a schedule in your website. Your online event schedule can be displayed to users in several ways. It can be integrated into your website using an iframe, used on a mobile device or simply linked to SuperSaaS. If you’d like to change the appearance and color scheme of your schedule, you can learn more about how to do this and other formatting options here.